Shun knives are at the high end of the cost spectrum and come in rosewood boxes for display. Shun, pronounced 'Shoon,' is a type of knife that is made with an extremely hard VG-10 cutting core to help keep the edges sharp for a longer period of time. 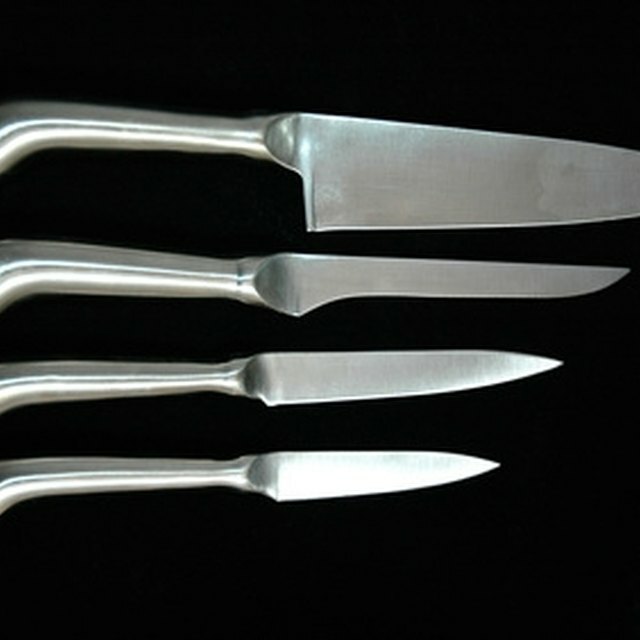 The honing steel used to sharpen these knives uses a micro-ridged steel rod that aligns the edge. The handles are made of Pakka Wood, which is moisture-resistant. The honing steel has a 16-degree honing guide to help the user sharpen the knife's edge. Hold the dish towel around the handle of the Shun honing steel rod. This will help to keep the rod from spinning in your hands as you grasp it. Wet the honing steel rod and allow the excess water to drain onto the towel you have wrapped around the base. Hold the Shun knife in the opposite hand and use the notch in the side of the honing steel rod to guide your knife into the correct 16-degree angle for sharpening. This will help to keep the edge on your knife as well as keep you from putting ruts or dings in the edge. Push the knife away from you while sharpening the side closest to the steel rod, and pull the knife towards you on the rod while sharpening the side away from the rod. This will put the precision edge back onto the knife that you are sharpening. Repeat Step 3 an additional five times on each side and then rinse under cold water to remove any dust or debris.